A few years back the southern end of Pakiri beach, where it meets the marine reserve line of Goat Island, used to be one of my favorite fishing spots for both kayak and kite fishing. A good mate Dave Clark showed this particular spot to me. Even though encounters with small mako sharks were a daily occurrence - either seeing their fins scooting past - or feeling the thud of them knocking the kayak from below. It was somewhat disturbing, we carried on regardless and managed some incredible catches. Recently while filming with 20/20 and National Geographic regarding my encounter with a huge white shark last year I decided to reinvestigate this location with Dave Clark, Peter Vesetolu and Garry Franklyn. It was a great days fishing and filming and obviously is still a top fishing hotspot. Despite the fact the film crew constraints meant we had to fish over the top of the tide and in good light we still caught a few snapper between 3 and 4 pounds even though this is the worst time to fish here. Had we fished when we wanted - change of light with the tide running - I am certain our catch would have been more like the previous trip (see photo left below). 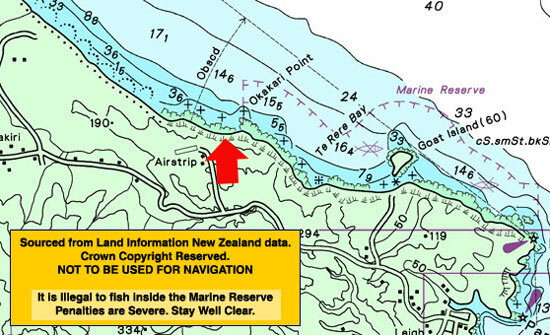 Locating yourself just on the Pakiri side of the marine reserve line you will see a green shed in a small valley adjacent to the reef. On an incoming tide dawn or dusk is the go here and I set my kayak long line across the face of the kelp. Personally I like to use sacrificial weights either end of my long line in case it snags. I use a variety of Target Snapper Hook traces. My preference is five 5/0 floating bead traces, then five normal 5/0 traces all the way along the line. I have found this mix of traces to be very efficient, the floating bead traces will deploy the baits higher than the normal traces and they drift naturally with the movement of the kelp. It's a bit like stray-lining half your baits and bottom fishing the rest. Right: the catch from the previous trip. On bright days we have found it best to stay in line with the landmarks above and head straight out as far as the seaward side of Goat Island. Out here the deeper water and current is much more appealing to shy snapper when conditions are clear. 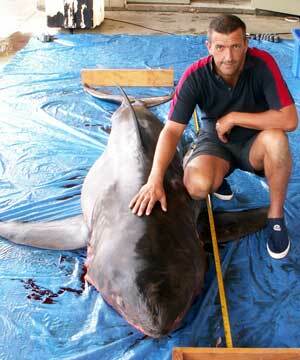 As part of the 20/20 program Paul attended the autopsy of this 3 metre great white shark. The pic on the right shows the three metre long great white shark prior to the autopsy. When the syomach contents were exposed it was found to be chock-a-block full of whale blubber. 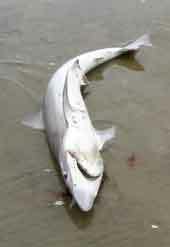 Paul was amazed at the huge size of of the sharks liver which filled most of the gut cavity. He was also suprised at the tiny brain in control of such a powerful animal brimming with such formidable weaponry. 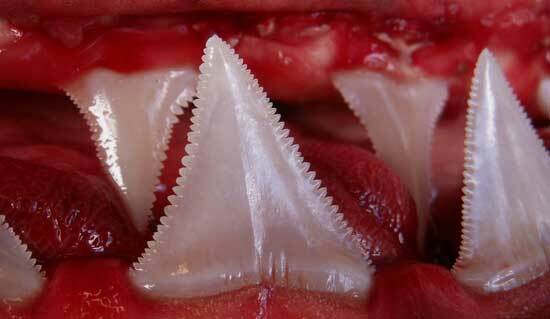 Below : A close-up of the jaw and teeth of the great white shark at the autopsy. I phoned the shop on my way to Pakiri Beach on Thursday, March 2nd to ask for some fishing tips after two previous trips plagued with paddle crab problems. To beat the crabs, your guys pointed out that we had to keep the gear moving out quickly. I put the first set out with frozen mullet and then realised I had forgotten the bottle. All I had on me was a rectangular Tupperware container so we wrapped line around and under the lid several times, then clipped it to the line. It worked a treat! Next problem was we were now overweighted on the first set and the gear was stalling. We decided to leave it fishing at about 250 metres out while I went back to the local shop for a milk bottle for the second set. The first set was pulled in after only 20 minutes and, to my delight, a small kahawai was hooked up and it quickly became bait for the second set. Putting on the Flexiwing Skyhook for the second set, and the recently acquired milk bottle, the gear went out like a rocket. On the long back trace I put on a Tsunami rubber lure. The Skyhook added heaps of pull and the wind started picking up. I ran the Penn 9/0 with braid right out to 1200 metres or so offshore. We could see the flag and bottle lifting out of the water at times, sometimes as much as 30 feet or more, but figured, oh well, this was our last chance for the day and at least that might make the rubber lure look more attractive. We hauled in the gear after 45 minutes and landed three snapper and two fat gurnard, one of which had swallowed the lure. Two of the snapper were a bit on the small side so we put them back. All in all we did two sets of 8 hooks each. With the winds being a moderate to strong southwesterly the gear went straight out and we had a great afternoon's fishing! Hi Richards the name fishing's the game. I live in Waiuku and fish when ever where ever I can, recently we were at Kariotahi fishing a north east wind. I hooked my new kite up to the 9/0 Penn Senator, threw on eight hooks and sent out 1200 meters of braid. I know eight hooks is overkill but I only catch two or three at a time, so I figure too many is better than not enough. I left the line out for approximately 45 ins and sat on my chilly bin. When I started to pull it in the rod bent more then normal even though the wind was light. I knew straight away it was either going to be a very good set or a bad one. It took about 35 minutes of hard hauling to get half the line in. Then the rod bent over even more and the line got so tight I stopped winding. The drag was already set so I just held on and waited. Ten or 15 minutes later the rod jerked and away the line went as the fish took off. I let it run until the fish was around 1000 meters offshore before tightening up the drag even more. Things were getting desperate as I was running out of line. The rod bent again and then we reached an impasse, whatever was on the line was not moving, and me refusing to give an inch. I waited and waited, then the rod tip slowly came back up. I was winning! I gave my tired arm a bit of a stretch then got back into it. I was determined to bring in whatever was on the end. ED : A Muriwai Beach stingray about a third the size of the one Richard caught. The line was so tight I thought I was going to lose the lot, but it was moving, so I kept winding. Just when I had recovered around three quarters of the line, again the rod bent to almost breaking point. As the sun set in front of me I knew this fish was far from done, all I could do was hang on again. The other people on the beach were gone by now and the tide was on its way out. Then, away we went again! The fish was pulling, the rod bending, and the line peeling off the reel at an alarming rate. It didn't take long before the line was almost all out for the second time! I locked the drag and dug my heels into the sand, it was all I could do. Again I thought the line must break under the load, but finally I was able to gain a little line - it was slow progress. It was also dark and the lights of the wagon did not help much. This time when the fish dug in I just kept winding. Finally, two and a half hours later, my partner said she saw the kite, a few minutes after that I saw the dropper, whatever was on the end was not coming any closer. I called my lady to come and hold the rod as putting it in the holder might not be a good move. I walked the line in until with the help from the lights on the wagon there it was, a huge stingray. Its eyes must of been 12 inches apart, the part of the wings that were on top of the sand was about 7 foot across not including the tips. I never saw its tail and knew I didn't want to. My lady, well she was freaking out big time! I called her to get a knife and ran my hand down the line to the start of the dropper and cut the line before turning and heading back to the beach. The ray was gone! Some people came by that were there earlier and asked if we were OK, we said sweet as, thanks and headed home. It was a good work out and we still had no fish, never mind that's fishing. Bryce Waters fished a kontiki baited with squid between between Aotea Harbour and Kawhia Ocean Beach carpark. He only caught two kahawai for two sets, so the fishing down that way is pretty slow. "Matt Cowan reports good compliance with the fishing regulations on west coast beaches by kitefishers and longliners. He also mentioned the high amount of wastage of mainly school sharks and rig because many are left lying on the beach rather than being returned to the water." Ed : Kite fishers should be more aware of what they are doing when out fishing. It is really easy to get in the habit of returning unwanted catch immediately to the water. 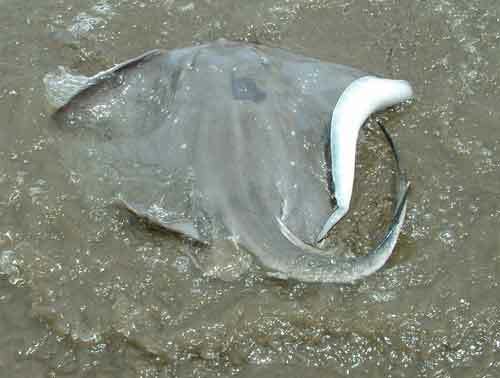 It is certainly not good look when kite fishers leave rotting shark and stingray carcasses on the beach. Rob from PFK went fishing last Sunday at Kaiaua. He reports being plagued by light winds but still managed to get one shot of 10 hooks out in the late afternoon. Because of the light wind he only managed to set to 450 meters, despite this he caught five small snapper to 30cm. The boat fishermen were doing well with most catching good bags of pan size snapper. Had the wind been stronger Rob was confident he would have got a much better result. Robbie Cullen reports that Uretiti Beach is fishing well in the evenings. His neighbour went out last week and caught a good bag of snapper up to 3 pounds this week. He warns other kite and kontiki fishers to arrive in daylight and scan the area well to find a gap between the many crab pots, which are set just off the beach, before setting any gear out there. Over the next few days 120,000 snapper fingerlings will be released into Tasman Bay, providing a welcome boost to snapper stocks for the inshore recreational and commercial fisheries. The fingerlings, which are between two and six centimeter's long, have been reared by Crop and Food Research fish scientists. Research leader Alistair Jerrett says the original goal was to raise snapper for use in their research for the seafood industry. "But we've been so successful that we have many thousands more than we need. Not only are a number of businesses now interested in our ability to raise fish, but it provides an excellent way to enhance the snapper fishery in the area," Mr Jerrett says. 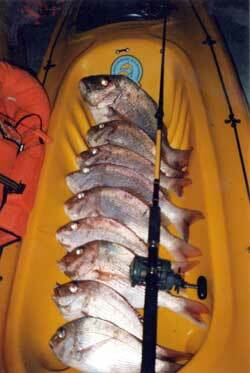 Snapper are a very good experimental fish for post-harvest seafood research program's. "We're working with the seafood industry to develop technologies and systems which enable companies to maximise the value from every fish caught," he says. "That includes understanding much more about the changes which go on in fish after harvest so the industry can provide consumers, both here and overseas, with the very best quality seafoods." The success of the rearing program means that that the research tanks are crowded. Mr Jerrett says while approximately 120 000 of the fingerlings have been released into Tasman Bay, he hopes a further 30 to 40 000 will also be released in the Marlborough Sounds. Scientists successfully reared snapper last year and these were transferred into sea cages in the Marlborough Sounds and released earlier this year. These were among the first to join the wild fishery. The parents of the fingerlings this year were 12 large tank-dwelling Tasman Bay snapper. Getting snapper to breed in captivity has been an exacting task for Mr Jerrett and his team. First they had to learn how to grow snapper food - algae and plankton - and then they harvested snapper spawn from the tanks. While the textbooks say it is difficult to get wild snapper to spawn in captivity, Mr Jerrett has not found this to be the case. "The parents, some of which have been held at the Nelson laboratory for nine years, must be pretty comfortable in our tanks. We spoil them a bit though." Mr Jerrett is enthusiastic about the potential their new snapper-raising skills have to revitalise the inshore snapper fishery. "What we'd love to do is play a part in bringing back the good old days of snapper fishing in Tasman and Nelson Bays. "When released, these fish and subsequent generations represent the first steps towards boosting the inshore and recreational fishery." Fishing industry representatives from the Challenger Finfisheries Management Company and Port Nelson Fishermens' Association visited Crop and Food Research this week. The Mayors of Nelson and Tasman have also been in for a look. "The industry is very enthusiastic about what we are doing and its potential to enhance the local recreational and commercial fishery," Mr Jerrett says.